I'm pretty certain Vacaville is The Hot Spot to be a Cube. There are about a dozen of them driving around looking all strange. But this one is the best with its license plate. I don't like the look of the Cube (there's one down the street from us), but that is dead clever. The look is growing on me, perhaps because I see like five of them every day. 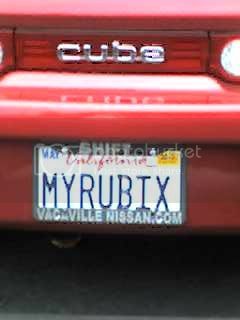 The license plate made me like them all the more (perhaps I should just like the owner). hehehe! i think the cubes look funny. i think the smart cars look funny too, but i'm just accustomed to how regular cars and trucks look. They are totally funny looking, and I'm not the hugest fan of boxy vehicles. Jonathan and I have only seen one Cube in the wild. It kind of trips us out, what with that uni-window in the back. After close inspection, I'm certain the Versa is vastly superior. I knew you'd appreciate it. In fact, when I saw it, I was all L WOULD LOVE THIS. Mina was with me, so I got to say that outloud. The uniwindow is freaky-deaky. Spend more time in cow-town, and you'll see a lot of them strolling among us boring car drivers. LOL, you know me too well. Or you stalk me and J all the time. It's hard to switch. On behalf of Henrietta and My Awestastic Versa, I object to the "us boring car drivers" remark! If you do not appreciate your pretty red beast, I will take it away from you. TOMORROW. mwa ha ha ha! I'm stalking you and J right now - teleportation stalkation! Field of research is in its infancy. I heart Henrietta and your tragically named Awetastic Versa (seriously, we need to get your poor car a good name). I was going to type Awesometastic but my fingers ran out of juice. I'll be home around 2pm. Jonathan may be home if you beat me here. TM me if you need his phone number. Our doorbell is dead, as you well know. It would be magical if we arrived at the same time, though.